Combi, or combination boilers, are the UK's most popular type of boiler. They can be an economical option, as combi boilers only heat the water you use. People also call them regular or heat-only boilers. They send hot water to your radiators and a hot water cylinder. 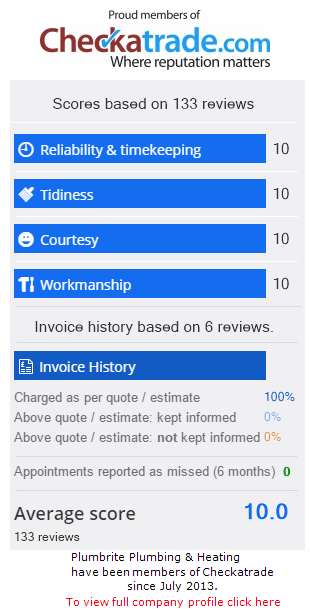 We aim to give you the best possible service without charging you a fortune - our reputation depends on it! We provide a highly professional service at a very affordable price. If our workmanship or any parts we've used fail within 3 months, we'll come back free of charge and make good the repairs - GUARANTEED! This does not affect your statutory rights. At PlumbRite Plumbing & Heating we only install reliable, high efficiency boilers from the top boiler brands. Vaillant are one of the UK's most highly regarded brands and offer a range of different boilers in their EcoTec. A new Vaillant boiler installation will come with a manufacturer warranty period, meaning you are completely covered if there are any problems. We've worked with Worcester Bosch for a long time.